With the medulla tab selected the possible values for the medulla field of the search key are shown in the search key view. Each possible value is illustrated with either a line drawing or a photo and a brief description. The currently selected value will have a thin dotted line as a border. Every search key field can be given an undefined value. This is always the first value listed and is always shown in the top left position and listed as "Unknown", or given a value of 0 (zero). By default, all fields of the search key are set to have an undefined value. To select another value, click with the mouse on the appropriate drawing or photo. For this tutorial assume that the medulla of the observed hair sample is a narrow medulla lattice. In the example shown below this has been selected as the value for the medulla field of the search key, by clicking on the photo labelled "Narrow medulla lattice". 1. The search summary has updated to show Narrow medulla lattice as the value for the medulla field. 3. 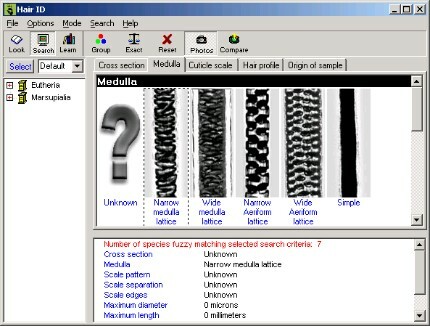 The number of species matching in the search summary has changed to show only those species that have a narrow medulla lattice. 4. The sub classes showing in the species explorer has updated to show only those that have species that have a narrow medulla lattice. As the search summary in the diagram below shows there are now seven species that match narrow medulla lattice. To reduce the number of possible matches we will next give a value to the Cuticle scale search key field and narrow down the list of possibilities. To do this click on the 'Cuticle scale' selection tab to move to Step 3 of the tutorial.